Known for its striking views of Table Mountain, Bloubergstrand Beach, a sweeping stretch of white sand in Table Bay, attracts flocks of visitors looking to relax, surf, cool off in the chilly waters, and enjoy the scenery. Wandering the long, broad beach, the site of a famous 1806 battle between British and Dutch colonists, you might get a glimpse of the Cape fur seals, humpback dolphins, and whales. A popular recreation area, the beach boasts ample space for sports, picnicking, and barbecues, while the local trade winds provide perfect conditions for kitesurfing and windsurfing. 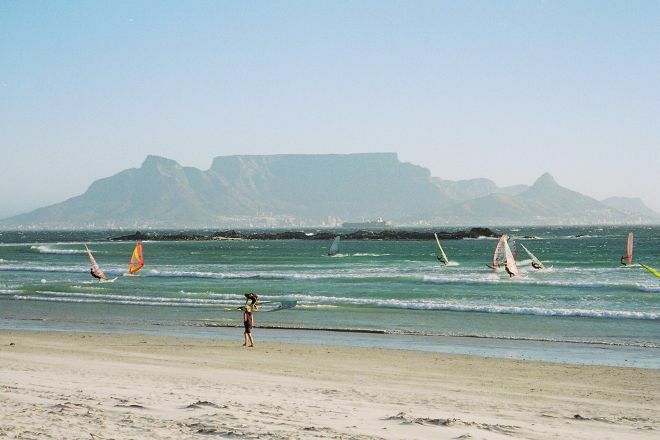 Make Bloubergstrand Beach a centerpiece of your Cape Town vacation itinerary, and find what else is worth visiting using our Cape Town attractions planner . Especially if you like kite surfing, this is the perfect beach. Also for sunbathing fun but only if there is not too much wind because then you really sandblasted. On the other side of the boulevard are what to eat and drink. Every day, we help thousands of travelers plan great vacations. Here are some tips on how to use your Listing Page to attract more travelers to your business - Bloubergstrand Beach. Promote your permanent link - https://www.inspirock.com/south-africa/cape-town-central/bloubergstrand-beach-a822834467 - on your website, your blog, and social media. When a traveler builds a plan from this page, the itinerary automatically includes Bloubergstrand Beach. This is a great way for travelers looking for a great vacation in your city or country to also experience Bloubergstrand Beach. Promoting your link also lets your audience know that you are featured on a rapidly growing travel site. In addition, the more this page is used, the more we will promote Bloubergstrand Beach to other Inspirock users. For best results, use the customized Trip Planning Widget for Bloubergstrand Beach on your website. It has all the advantages mentioned above, plus users to your site can conveniently access it directly on your site. Visitors to your site will appreciate you offering them help with planning their vacation. Setting this up takes just a few minutes - Click here for instructions.